It’s Valdosta’s turn, after Lowndes County approved up to $40,000, tomorrow (Thursday 11 Aug 2016), it’s on the Valdosta City Council agenda for the city to approve a similar amount, adding up to matching what USGS is willing to supply. 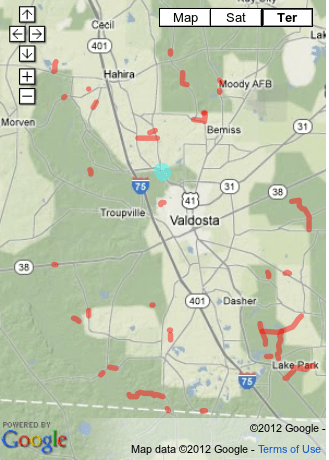 It was Valdosta’s idea in the first place, and maybe this interactive flood map for a small part of the Withlacoochee River through Valdosta will help prevent, or at least provide early warning for, the types of road closings and other floodings that happened in 2009. This entry was posted in Government, Safety, Valdosta City Council, Water and tagged 11 August 2016, 2009, flood, Georgia, Government, Gretchen Quarterman, inundation, LAKE, LIDAR, Lowndes Area Knowledge Exchange, Lowndes County, Lowndes County Commission, map, Regular Session, Safety, United State Geological Surrvey, USGS, Valdosta, Valdosta City Council, Water, Withlacoochee River on August 10, 2016 by John S. Quarterman.